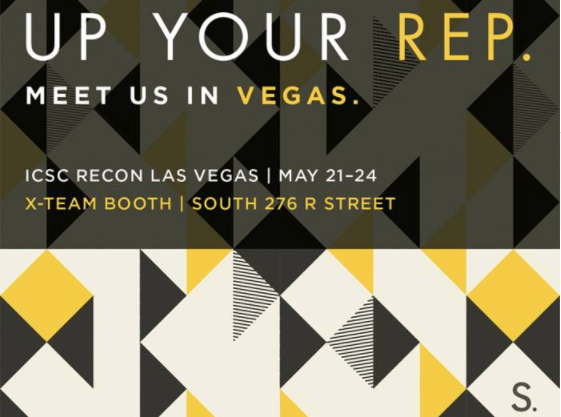 In just a few weeks, we’ll pack our bags and head out to the Las Vegas Convention Center for commercial real estate’s biggest event of the year: RECon. We had an amazing time last May (and have the photos to prove it) and can’t wait to spend time with our clients at this year’s event. We’ll be taking in the exhibits and speakers (this year’s keynote speakers will include Apple’s Steve Wozniak and Shark Tank’s Barbara Corcoran) at this always-incredible convention. Our team will also be sponsoring the Bisnow Beltway Bash and attending the Maxi Awards dinner, where we are nominated for our work with Peterson Companies on Downtown Silver Spring’s OUTBOX installation and celebrating client nominee MarketPlace Development. And we’ll be documenting our adventures every step of the way with our partners at Streetsense. To up your rep and get connected with our Streetsense colleagues, be sure to stop by the X Team Booth at South 276 R Street. And if you can’t make it out to this year’s event, we’ll be covering it all across our social media platforms: Facebook, Twitter and Instagram. And of course, stay tuned to the blog for the latest details on what’s sure to be an unforgettable event!